Evon Montgomery's HORSES 1-2-3 Riding System is the most COMPLETE, easy to use, comprehensive approach to training a horse! See why horse trainers throughout America are COPYING our methods! Evon Montgomery is a horse lover. She got bitten by the horse bug early in life and has continued in her love and passion of horses even now. At her home location in Saxonburg she is continuing her pursuit of horses in giving lessons and training horses which she started 30 years ago. She is approachable and sincere in her efforts to help everyday horse owners and riders become their individual BEST. Evon also co-ordinates and hosts equine events at the Saxony Farm facility as well as traveling to many venues across the country doing Clinics and seminars. Evon is also an Open, Obstacle and Ranch Versatility Judge; Ring master, Scribe and Show Steward for Open and AQHA shows. She is a member of AQHA, APHA, NRHA, Western Dressage “train the Trainer” program, and currently owns Paint and Quarter horses. Evon and her husband Craig ride their horses across America, riding on trails and participating in horse shows and other various horse events. Is It True That Evon Is A Guest Speaker At Horse Expo’s Throughout The Country? YES! Evon speaks at Horse Expo’s throughout the country on topics such as : Horse Ownership Basics, Horse Body Language, Traveling and Camping with Horses, Teaching communication skills for horse and human, Keys to the Gait for gaited breeds, Obstacle course and development of confidence on the Trail, Confidence building for the Event and Dressage riders and Western Dressage. How Come I Have Seen A Similar 1-2-3 System By Other Trainers? Immitation is the sincerest form of flattery! Make no mistake, this wonderful system was designed carefully, through years of study and practice by Evon Montgomer. Evon is flattered that so many trainers are now trying to adopt this system, but none have the depth of information or implementation that Evon’s course has to offer! 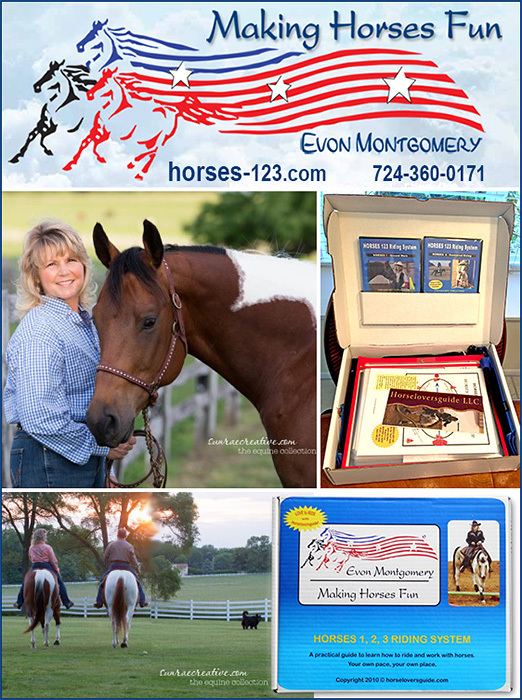 Evon Montgomery is the ORIGINATOR of HORSES 1-2-3 Riding System. It came about because of necessity. Over years of training horses, working with people, Evon figured out that people learn better if they understand why and how the technique works and also if the person and horse are CALM. Nervous people plus nervous horses do NOT learn well. So Evon used the techniques she learned while teaching young horses and adapted them to teaching beginner thru advanced riders as well. It is SAFE, FUN and educational all at the same time. Does Evon Work With All Breeds of Horses? Absolutely! Evon works with all breeds of horses, both gaited and non-gaited alike and believes that having an understanding relationship with your horse makes the horse ENJOYABLE and rewarding. Evon considers herself a “guide”, and leader of people and horses. She is a trainer with a “plan of action” that is simple, effective and easily applied to all riders in all walks of life. Knowing that in the world we live in, everyone wants everything right now and perfect from the start; she encourages people to take their time and develop a true understanding and long lasting relationship with their horse. Evon takes time to teach both horse and rider how to remain calm and collected to make the journey worthwhile. What If I Am A Complete Beginner? The1-2-3 program is a great place to start for complete beginners of any age. It is very easy to read and understand the diagrams. The patterns are written down on skill cards as well as demonstrated on DVD’s. I have testimonials from people as young as 12 and those young at heart from ages 40 -60 who are new to horses and the result is the same. Because the system explains both the how and why, it makes sense to people. Home schooled students are able to use it as their gym class activities and novice adults gain valuable information and insight without being overwhelmed by a “process” that is fast and furious. Beginners are encouraged to take each step slowly. Only do as much at one time that they can understand and comprehend. They practice at their own place at their own pace. How Does The HORSES 1-2-3 System Work? HORSES 1-2-3 Riding System combines DVD’s that you watch at home with Skill Card sets and a Numbered/Lettered Cone system that you take to the barn with you. They are 8 ½” by 11 heavy laminated, weather resistant, rugged cards that correspond with the DVD and are placed via “cone toppers” on top of the cones to make “ stations” . The cards also have the pits and tips for performing the exercises correctly. The unique Skill Card system start with very beginner exercises. The skills keep you focused on the task. There are 12 Beginner Skill cards, 12 Intermediate Skill cards and 12 Advanced Ground skill Cards. • How to keep from being stepped on while leading a horse will be discussed and demonstrated. Note: The HORSES 1-2-3 system describes the “why” it matters and “how” it works for you and your horse. The techniques are designed with every breed of horse and rider in mind. Each skill is designed to make you a better horse person. Whether it’s at the barn, in the ring, or at a show, you will be better prepared to handle each situation. How Can The HORSES 1-2-3 System Help My Horse To Become More Confident? HORSES 1-2-3Riding System also introduces common obstacles and HOW to address them. By STOPPING and letting the horses become curious before it proceeds instead of bolting off in fright, both you and your horse will gain CONFIDENCE. How Can 1-2-3 Help Me Rebuild My Own Confidence Riding My Horse? The reason HORSES 1-2-3 Riding System works to rebuild Confidence with your horse is because it creates a calm, peaceful relationship between you and your horse. I WILL teach you how to watch your horses breathing, it eye’s, it’s ear and nose along with whole body responses and what they mean to you and the horse. Note: Once you understand what your horse is thinking, you can be calm and confident. Your horse will stay calm as well because the it will learn that making a mistake is “OK’ . It reassures both you and your horse that if a mistake is made, no one is going to get punished. I will teach you to trust your instincts and keep safe while handling horses. How Can The HORSES 1-2-3 Program Help Riding Instructors? In addition to private individuals who want to increase their knowledge of horses and riding skills for both showing and pleasure use, the HORSES 1-2-3 Riding system is perfect for instructors or trainers who need a lesson program. Knowing how to do something is one thing, knowing how to impart that knowledge in an easy to understand and apply manner to your students is another! Horse instructors will love the 1-2-3 program and how it simplifies the skills they are trying to teach. Using the combination of DVD’s, Skill cards and Cone System, it is an in depth lesson program that would take many months or years to learn. It teaches beginner through advanced ground and riding skills and your students will be much happier with the colorful rugged “skill cards” to look at, instead of you scribbling some mini diagram in the dirt or on the back of a business card. The Cone System was originated by Evon Montgomery to help students learn in an easier fashion both how to ride patterns and at the same time, learn the dressage letters. Special Note: Because Evon has been training horses and giving riding instruction for over 30 years, she knows that people learn better when the material is SIMPLE as 1-2-3. Difficult material is hard to learn and can become frustrating. Who Uses The HORSES 1-2-3 Riding System? HORSES 1-2-3 Riding system is accepted and currently used in Pennsylvania, West Virginia and Ohio, New York,Wisconsin and Missouri. Groups such as: PATH international, 4-H, Horses for Hero’s, Emmaus Horsemanship and Equine assisted Learning Programs along with many summer camp, home school students, Riding schools lesson programs in both English and western facilities use the HORSES 1-2-3 Riding system to teach their students. Why Is The HORSES 1-2-3 Program So Successful With Horses Of All Ages and Breeds? Knowing how young horses progress is the key to how Evon put the exercises in order, they make sense to the HORSE. Horses learn balance and transitions when they follow a natural progression that takes time, this progression is the SKILL CARD system from beginner to advanced. This is NOT an instant overnight 3 ride wonder! The HORSES 1-2-3 Riding System was developed to take TIME. Learn how to spend valuable time with horses, getting to know your HORSE’S personality, how your horse learns and how your horse thinks, these are all part of the 1-2 3 process. Do NOT do all of the exercises in one day, even if you think you can.. Practice them in order until you and your horse ACTUALLY understand them. Take as LONG as you want! Go slow, but move on as soon as you understand the exercise. Too much repetition creates bad habits and behavior in horses. Move on, mix it up, play and have fun. Life is an Adventure, Saddle up and Ride! How Can I Remember What I Have Learned When I Go To The Arena To Practice? We’ve all done it… watched a video, been excited to try something new, and then we get to the arena to practice and suddenly what was once so clear is no longer clear! * Skill Cards you can take with you to the arena! * Cones with card holders available so you can put your que cards right on the cones! What Is The 1, 2, 3, Riding System Devised By Evon? HORSES 1-GROUND WORK- Teaches horse and human interaction using DVD’s, Skill Cards, Cones while doing beginner through advanced ground skills. Obstacles, maneuvers, and learning horse behavior and body language before riding in a SLOW, CONFIDENT manner as to CALM horse and rider – NO STRESS! HORSES 2 – CONTROLLED RIDING continues the learning process by using the skills that were learned on the ground to develop a riding partnership in a “controlled environment”. The object of a controlled environment is that it develops skill, muscle memory, horse reaction and human interaction in a fashion that goes from beginner to advanced horsemanship WITHOUT FRUSTRATION or CONFUSION. This in turn develops a CONFIDENT rider and leader of the “team”. HORSES 3- Trails, Trials, Travel -Use of the skills you learned on the ground and in the controlled riding situation to take you beyond you home facility with CONFIDENCE. TRAILS takes you first local, then regional then national or wherever your DREAMS lead you on horseback. TRIALS takes you to any type of showing situation or competition by again understanding the foundation of patterns, discipline and knowledge of a show ring situation. TRAVEL leads you on to ADVENTURE both across America and across Continents. Note: Horses 3 riding group gives has Evon as a team leader. Join Evon with a group she organized, or bring your own group and plan a trip to awesome destinations to ride horses, either with your own or provided horses. How Much DoesThe HORSES 1-2-3 Program Cost? Our complete kit is amazing— you will be surprised at the detail and the quality of our queue cards, DVD’s and lesson plans! The COMPLETE kit is only $240, or you can buy just the Horses 1 (Ground Work), and HORSES 2 Controlled Riding for just $130 each. Cones and card holders are extra but very reasonable. You’ll love how this system gives the tools for control, and confidence. Check out Evon’s Horse Gear and Riders Gear too! What Does InfoHorse Say About The 1-2-3 Riding System? I ordered the COMPLETE System for $240 and was honestly blown away when it arrived! The packaging, quality of the queue cards, the attention to detail absolutely was amazing. I have never seen anything so well done. Every horse owner can benefit from the carefully crafted knowledge that Evon has put together. Well worth every single DIME! I would give this system a 10 out of 10 rating and our highest possible recommendation to both horse owners and instructors alike! Order the HORSES 1-2-3 Riding System Today and Get The Control and Confidence You Need! The HORSES 1-2-3 Riding System can make a real difference in confidence, skill and control, for both you and your horse. Don’t sit and struggle, help is just a phone call away. Call Evon today and order your HORSES 1-2-3 Riding System and enjoy the benefits forever.